It is sad, but in today's world it seems that good manners have been thrown out the window and left in the dust. People seem to have become more and more self-absorbed and unwilling to consider another human being before him or herself and children feel more and more entitled to whatever it is they want. For parents, we realize that to a certain extent our children are a reflection of our values and us. For parents who are determined that their child will not grow up to be a narcissistic adult acting like a child with poor manners and a self-absorbed attitude, it is so important that we make sure our children display proper manners, understand the importance of them, and appreciate the needs of others. As with most tips to disciplining children, the first is obviously modeling the behavior you are hoping to enstill in your child. Children do what we do and not necessarily what we say so show your child how to have good manners by having them yourself. At the core of behaving with good manners is the concept of respect. Respecting another person is at the center of good manners. It is expressing sensitivity for another while showing them respect that is so crucial is raising children with good manners and a sense of sensitivity for another. Showing respect for others begins in the home so if your child does not respect you as their parent, he or she will likely not respect anyone outside of the home. Children are never too young to teach good manners. It has been found that young children who are taught good manners are more polite children and adults so start young and stay consistent. Teaching your child to say "please", "thank you" and other polite words should start at a young age and always be expected. If your child wants a cookie, for example, encourage them to say "please" and then "thank you". Teaching Children Manners Tip #5: Avoid Forcing Manners; Encourage Them! Forcing good manners does more harm than good. If forced, children will use their manners because they are "forced" to and not because it is the right thing to do. Making sure your child appreciates the importance of good manners can help your child to realize the importance and not just go through the motions. 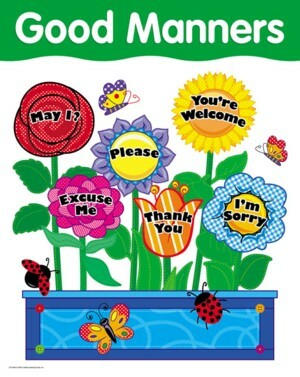 When encouraging your child to use good manners, encourage them in a positive way instead of forcing them. When disciplining your child, do so in a polite way. Avoid calling them names, losing your temper, embarrass them in public, or any other act that could be portrayed as unloving or poor manners. Yes, we need to show tough love to our children at times, but that does not mean that we treat them with disrespect, insult their self, or act with bad manners. In our world, there are so many different people, personalities, values, character traits, views, likes, and dislikes. It is inevitable that we will not agree with everyone all of the time. Teach your child to tolerate another person or situation that they may not agree with or are different from and to show respect for the person or situation despite the fact that they disagree.